"New Beginning, from the author of From Sad Beginnings to Happy Endings, is a beautifully written book that shines life the North Star, leading the reader to a better place! "Dolly's blessed goals are to relieve people of pain and suffering and to help make the world a better place, free from hate and prejudice. The culmination of her life's learning and wisdom is found in her brilliant new book, New Beginnings, a tribute to humankind's strength and spiritualism. "New Beginnings refers to renewal, cleansing, awakening, growth and learning. Dolly includes a wide variety of subject matter, from the millennium...to peace....to courage. "Dolly speak of God, healing, pain, scars, forgiveness, prejudice, feelings, death, and love. 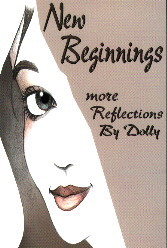 In New Beginnings, Dolly shares with us the intimate details of her childhood, early adult life, marriage...and the trials and tribulations of living that life. "More importantly, Dolly teaches us the strength and serenity that can come from the growth derived from these experiences. New Beginnings illuminates the mistakes that Dolly (and so many of us) has made. But in Dolly's case, it reflects the new beginning she enjoyed after each and every happening." Dolly is a wife, mother, homemaker, and grandmother. She was born and reared in San Francisco. She was president of her children's Mother's Guild and served on her Parish Council. Her children went to the same grammar school she had attended. She lived in the same house she grew up in until June of 1995. She now lives in Windsor, California, with her husband of thirty-seven years. For relaxation, she writes her poetry, read, watches movies, and loves to sing and dance. Dolly is a member of the International Society of Poets. 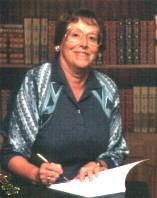 Many of her poems have been published and recorded. She has won several Merit and Editor's Choice Awards. She has had her poems published in the Best Poems of 95, 96, 97, 98, and Best Poems of the 90s. She was asked to join the National Poetry Hall of Fame. She hopes that through her poetry she may be able to help people with their pain and suffering and to help make the world a better place, free from hate and prejudice. by Dolly Braida, LC 96-61846, 24 p. (orig.) July 1997, $7.95 (0-9658113-0-1), Jo-Eric Publications. This is an enjoyable read no matter the age. Children will love each bright colored page while they look through the book, even if they are unable to read as yet. It's a lullaby your children will want you to read or sing to them over and over again. It is unique in the words and bright illustrations to depict each verse of the poem. The sheet music is included at the back of the book for anyone who would like to play the music. The melody is simple, pleasant and easy to learn. Anyone who would like a cassette of the melody can order it through the publisher. The lullaby is from the author's collection of poems "From Sad Beginning To Happy Endings." Ira Westreich who has recorded many poems and who is also a lecturer said, "It is a very enjoyable poem and the words just dance off the tongue." Book: ISBN # 0-9658113-0-1, cassette: ISBN# 0-9658113-0-1-X. From Sad Beginning To Happy Endings, by Dolly Braida, LC 94-69568, 2149. (orig.) Nov. 1995, $14.95, ISBN # 1-56550-028-8, Vision Books International, distributed by Joe-Eric Publications. Orders only (888)-838-2425. This book is more than a collection of poetry. It's a book to help healing and learning how to forgive. Dolly's poetry gives meaning and hope to controversial issues. She embraces life's problems with words of encouragement, giving readers hope and inspiration for happy ending in dealing with their own challenges. In this book you will find feelings you never thought you could reveal, expressed through poetry. The last two parts of her book tell a little about her life. Through this book and the sequel she is now working on, she's trying to stop hate, prejudice and anger in society today, and to help people heal a lot faster than she did from physical and mental abuse. Many people, even young children have told her that they can relate to her book and has helped them in some way. This book will also be marketed as a self-help book for healing. It would make a great gift and should be in everyone's home, where they can pick it up and refer to it when needing help to get past hurting to thinking positive toward forgiving. To order, contact: Jo-Eric Publications, 528 Mallory Ave., Windsor, CA 95492-8884. Orders only; Tel: (888)-838-2425. 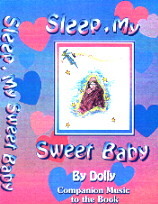 E.mail JoEricPub@aol.com The Lullaby book and tape may also be ordered through Ingram Book Company.